In the current context of global warming and environmental concern, we need tools to evaluate and monitor the evolution of our environment. The evolution of animal populations is of a special concern in order to prevent changes of behaviour under environmental stress and to preserve biodiversity. Monitoring animal populations however, can be a complex and costly task. Experts can either (1) monitor animal populations directly on the field, or (2) use sensors to gather data on the field (audio or video recordings, trackers, etc.) and then process those data to retrieve knowledge about the animal population. In both cases the issue is the same: experts are needed and can only process limited quantity of data. An alternative idea would be to keep using the field sensors but to build software tools in order to automatically process the data, thereby allowing monitoring animal populations on larger geographic areas and for extensive time periods. Legend: Raw recording of fish sounds, August 2014, Corsica, France. Legend: Filtered recording of fish sounds to hear Roar between 5s and 13s and Drums between 22s to 29s and 42s to 49s. Legend: Filtered recording of fish sounds to hear Quacks and Impulsions. Both sounds are quite short (<0.5s) and are heard all along the recording. However, to make a computer automatically classify a fish sound into one of those four groups is a very complex task. A simple or intuitive task for humans is often extremely complex for a computer, and vice versa. This is because humans and computers process information in different ways. For instance, a computer is very successful at solving complex calculations and at performing repetitive tasks, but it is very difficult to make a computer recognize a car in a picture. Humans however, tend to struggle with complex calculations but can very easily recognise objects in images. How do you explain a computer ‘this is a car’? It has four wheels. But then, how do you know this is a wheel? Well, it has a circular shape. Oh, so this ball is a wheel, isn’t it? This easy task for a human is very complex for a machine. Scientists found a solution to make a computer understand what we call ‘high-level concepts’ (recognising objects in pictures, understanding speech, etc.). They designed algorithms called Machine Learning. The idea is to give a computer a lot of examples of each concept we want to teach it. For instance, to make a computer recognise a car in a picture, we feed it with many pictures of cars so that it can learn what a car is, and with many pictures without cars so that it can learn what a car is not. Many companies such as Facebook, Google, or Apple use those algorithms for face recognition, speech understanding, individualised advertisement, etc. It works very well. In our work, we use the same technics to teach a computer to recognize and automatically classify fish sounds. Once those sounds have been classified, we can study their evolutions and see if fish populations behave differently from place to place, or if their behaviours evolve with time. It is also possible to study their density and see if their numbers vary through time. This work is of a particular interest since to our knowledge, we present the first tool to automatically classify fish sounds. One of the main challenges is to make a sound understandable by a computer,that is to find and extract relevant information in the acoustic signal. By doing that, it gets easier for the computer to understand similarities and differences between all signals and in the end of the day, to be able to predict to which group a sound belongs. 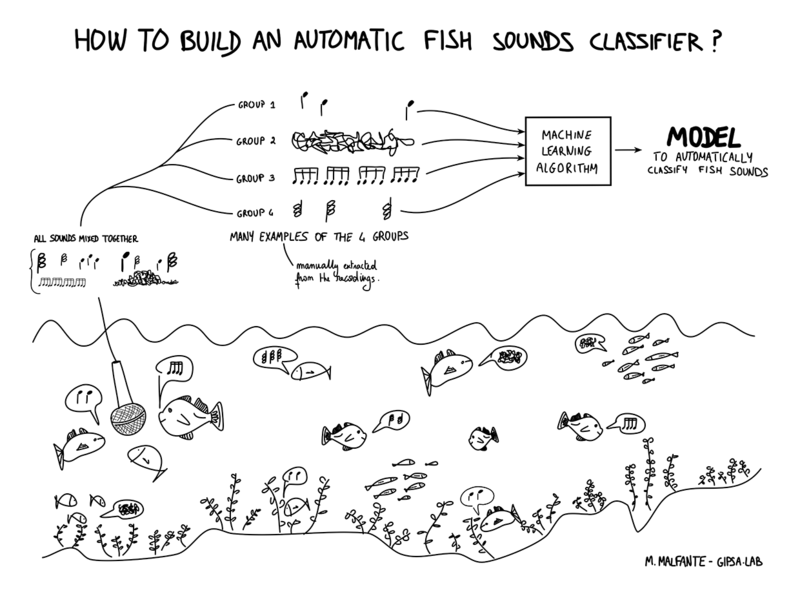 Legend: How to build an automatic fish sounds classifier? Illustration.